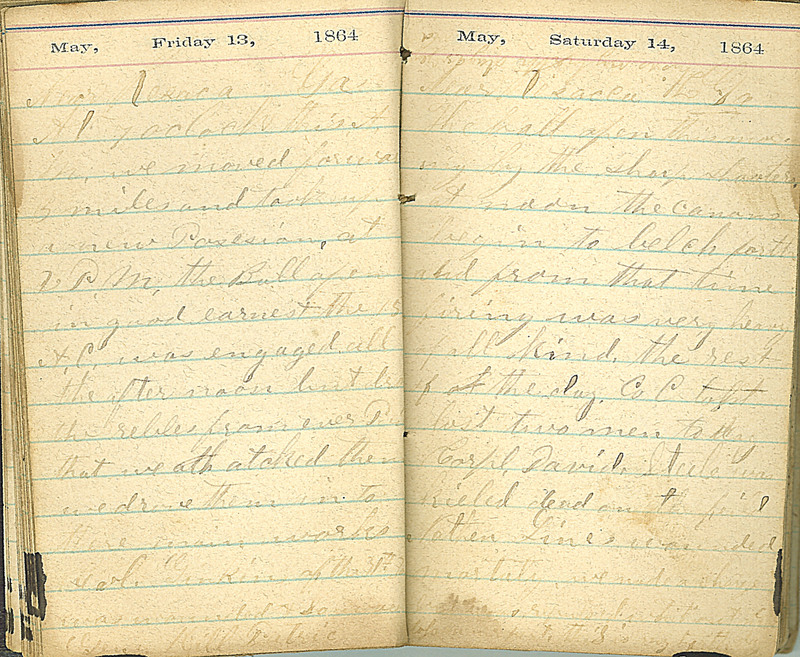 May, Friday 13, 1864 Near Resaca, Ga. At 7 oclock this A.M. we moved forward 13 miles and took up a new Posision, at 2 P.M. the Batl open in good earnest the 15[th?] A.C. was engaged all the afternoon but dro[ve?] the rebles from every Poi[nt?] that we atcked them. we drove them in to there main works Col. Jenkins of the 31th Io[wa] was wounded & so were Gens. Hill [&?] Patrick May, Saturday 14, 1864 Near Resaca, Ga. The batl open this morning by the sharp shooters. at noon the canons begin to belch forth and from that time firing was very heavy of all kind, the rest of the day. Co. C lost two men to day. Corpl. David Steele was killed dead on the field Nathen Lines wounded mortaly. we made a charge but were repulsed without [mutch?] loss [?